You Hate it or Love it!! "Welcome to the strange world of product placement, marketing and production planning within the late 1960s Suzuki organisation." "There is no-one on this planet, not even the so-called marque experts, who can tell you why the 1969 Suzuki T125 is so totally and utterly different from everything else on two wheels. The Suzuki T125 Stinger, from time to time referred to as the Wolf and sporadically as the Flying Leopard, is absolutely and emphatically unlike anything else within the company’s model range." "On the showroom floor the Stinger was primarily up against Yamaha’s feisty 125cc AS1 twin. It may have come second in terms of outright performance, but on style and elegance the Suzuki had the Yamaha nailed to the barn door"
It’s 1966, you are the Suzuki Motorcycle Company and everything in the world is wonderful. You are riding high on Grand Prix successes and your bikes are winning renown worldwide. In fact, in motorcycling terms, the world is your oyster, due in no small part to the meteoric accomplishments of your T20 Super Six 250cc twin, which has changed the way people perceive two-strokes. 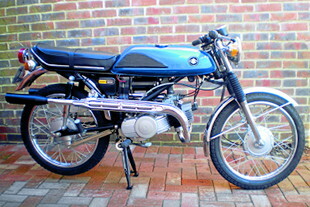 Quite logically, you trade on this success and produce a 125cc analogue (the T125) and all’s right with the world. The T125 is picking up business for you and 1967 is equally profitable, so what do you do for the 1968 model year? Er... you drop the bike and leave a void in your range. The following year you reintroduce the T125, but it’s an entirely different machine and unlike anything you (or anyone else) have ever made before. In fact you will never produce a machine like this again. Welcome to the strange world of product placement, marketing and production planning within the late 1960s Suzuki organisation. In fact Suzuki made large about the frame, even giving it its own name – Triform – and went on to stress both its rigidity and its lightness. At the same time that the Stinger was launched, Suzuki offered a trail bike called the TC120; a 120cc two-stroke single with a dual ratio output box. The fact that two effectively dissimilar machines used the same chassis can hardly be a happy coincidence. Even now, there’s a cynical school of thought which suggests that someone at Suzuki central simply overestimated the number of trail bikes it was likely to sell globally. This left Suzuki with far too many frames sitting around and something had to be done to get rid of them ASAP. In order to turn defeat into victory, the R&D boys were supposedly tasked with getting a twin into a single’s frame, while the styling team was told to come up with a look that would sell like hot cakes. The overall theme was then rather bizarrely touted as being Grand Prix inspired, yet if anything it was more street scrambler than anything else. For many, both then and now, it’s the high level, one piece exhaust system that makes the bike look so extraordinarily different from anything else. And strangely it doesn’t seem to matter if it’s the Mk.1 with its chrome pipes or the Mk.2 in satin black, both look equally appealing. Many argue that the late 1960s and early 70s were the heyday for Suzuki’s stylists; few could reasonably counter that there was ever a better piece of classic Japanese eye candy. If the cycle parts’ styling came over as radical for the late 1960s, then the engine was, visually, downright bizarre and unlike anything else before or since. Although, from an engineering perspective, it was very much a conventional twin, with horizontally split crankcases, the cylinders were canted upwards only a few degrees from being parallel with the road, making for a very unorthodox profile. With a whole mass of longitudinal fins running from plug cap to base gasket, the horizontal theme was even carried over onto the outer engine cases, as if to emphasise the engine layout. Very rarely do Japanese engine designers get to play so fast and loose with external styling. Some have argued that the bike takes its engine design from the Moto Rumi Sport of 1951 or the subsequent Formichino scooter. Although there’s a semblance of similarity, the Suzuki used modern flat-topped pistons in place of the Rumi’s deflector units, along with so many other intrinsic differences that it would be hard to accuse the Japanese, on this occasion at least, of outright plagiarism. On the showroom floor the Stinger was primarily up against Yamaha’s feisty 125cc AS1 twin. It may have come second in terms of outright performance, but on style and elegance the Suzuki had the Yamaha nailed to the barn door. Add in Honda’s rather staid corporate looks of the period and the little Stinger must have looked like a Parisian model in a room full of wallflowers to the teenagers of the day. 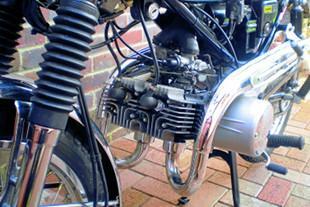 There’s no doubt that its makers were keen to keep the bike looking fresh as well. The Mk.1 only lasted for a year before the candy corporate blue or Roman red tanks were supplanted by full-on Mk.2 candy gold or pop green items, as contemporary and in your face as Slade, T-Rex or Roxy Music. In some markets (notably SE Asia) the Mk.2 was offered with low level pipes more in keeping with the supposed Grand Prix look. However you dress it up, Suzuki was very keen to make the most of its little baby. Ride-wise the bike was of its time; typically over-sprung and under-damped, with brakes best described as adequate, but the engine was a little peach. All of Suzuki’s two-strokes from the period somehow managed to capture the instant snap of a well-made stroker allied to the pulling power of a beautifully carburetted four-stroke. The Stinger/T125/Wolf/Flying Leopard was no exception, despite only being only a tiddler twin. Even in the wrong gear it was possible to roll on the throttle and pick up the pace in a way that would have simply choked Yamaha’s AS1 with excess fuel. Whether this ability was down to the porting, the hefty crank or a combination of both has never been fully investigated, but the unique engine delivered the goods in a manner atypical of most small stinkwheel twins. Perhaps the unusual carbs may have played a part? Long before Yamaha started advocating down-draught carbs and cylinder blocks at acute angles, Suzuki’s little twin was showing the way... if only by happy happenstance. The Suzuki Stinger’s raison d’être will probably never be firmly established. It might genuinely have been an attempt to move on an excess of cycle parts, but equally it could have been simply a very brave styling exercise. Whatever the motivation or intention, it’s certain that nothing like it ever appeared again. Production stopped in 1971, with the last bikes being punted out over the next year or so. Once again Suzuki dipped out of the 125 twin market for a while, before bouncing back in 1974 with the frenetic buzz bomb that was superbly misnamed as the GT125. In all honesty, the reasons for the Stinger’s very existence are almost an irrelevance. Enthusiasts and owners simply give thanks that Suzuki had the guts to produce something so obviously and overtly different. It would have been oh-so easy to go with convention and run with traditional styling and plump for the safe option. The very fact that Suzuki was brave enough to elect for a small slice of form over function unequivocally warrants the Stinger being assigned the sobriquet of Mould Breaker. Rather like a certain well known savoury spread you either love the Stinger or hate it; the one thing you emphatically cannot do is ignore it!